Image Navigation is announcing, at the 2019 IDS in Cologne, the world’s most advanced image-guided implant dentistry system. This new image-guided implant (IGI) system extends the use of CBCT scanners to include intra-surgical navigation and has real-time, speed of light, tracking with absolutely no on-screen lag. It also has sub-millimeter accuracy and a robotic auto-stop for maximum safety where the drill motor stops automatically and instantly turns off the drill if it is placed outside of the planned surgical area. The last few years have seen new opportunities open up in dentistry with significant growth in the dental implant market combined with technological improvements and cost reductions. It is estimated that more than eight million dental implants were placed in patients across the world in 2018, with more than three million in the United States alone. This USA figure is expected to increase by 33 percent to four million by 2022 and the growth rate in other areas, especially in Asia Pacific, is expected to be even faster. In the UK, there were an estimated 260,000 implants in 2018 which is double the number five years ago. Recent data also indicates dramatic shifts in the usage of technology for the placement of dental implants. In the USA alone, the market for dental CT scanners (CBCT Cone Beam scanners) has increased by over 300 percent from approximately 8,000 in 2012 to over 28,000 in 2018 and is forecast to be more than 40,000 by 2022. When using the IGI system, the dental surgeon views the tip of the drill and the pre-operative plan both superimposed onto a 3 dimensional CT scan that displays the bone, adjacent teeth, nerve canal, roots and sinus area. The IGI’s on-screen display has a unique fluent tracking system with zero latency. 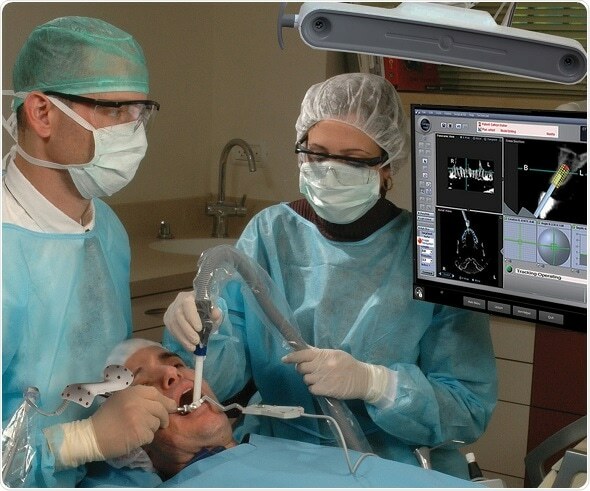 It adds real-time navigated digital surgery to digital imaging, digital planning, and digital restorations, thereby completing the digital puzzle. Data shows that more general dentists across the world are using the new, more affordable, technology which minimizes post-operative complications, reduce surgical treatment time and ensure greater accuracy when placing implants.